Happy Fourth of July! I hope that everyone is enjoying the day with some great BBQ, a favorite Beverage, and some Besties! I am drooling over my keyboard at the moment because my Brother in Law is using his smoker to cook ribs and macaroni and cheese. It smells so awesome! Speaking of awesome, I am linking up with an AWESOME ELA teacher today, Erin at I'm Lovin Lit. For a little Throwdown Thursday. 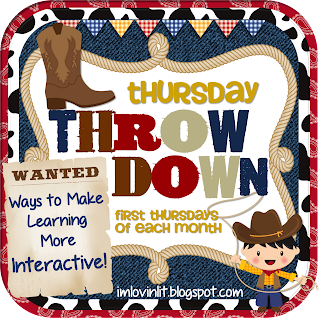 She is using the first Thursday of every month to talk about using her Interactive Notebooks. I'm loving the Interactive Notebook idea. This past year I used an Interactive Math Notebook. Next year, my ELA class will add one, and I'm attempting to use one in the social studies class that I now have to teach... HELP ME! I'm a math geek. I have to figure out a cool way to teach Social Studies.. I'll take suggestions, leave me a comment below! But back to the IMB... That 's what we called our notebooks this year. BEST THING I EVER DID IN MY MATH CLASS! Truth be told, it is rough around the edges. There are a ton of things I could have and should have and WILL do better, but I love that I stuck to it. One thing that I think is important is that you really stick to it! A sign of a good teacher is one who has the ability to reflect and make corrections. How is that for some APPR points! I really liked my use of FOLDABLES within the notebook. Our math text was completely online this year. So that math notebook became a real textbook to my Smarties. It was their go to reference. 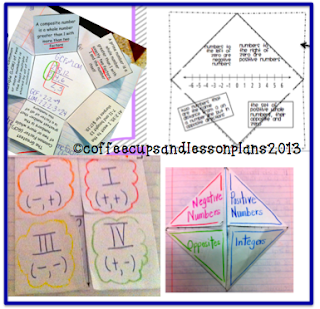 Below are a few pictures of some of the foldables that I used. If you click on the links below, you can see the posts where I have written about my Lesson on LCM/GCF and Integers and the Coordinate Grid. Thanks Erin for setting up this linky! I'm really interested in learning how others are using their notebooks in all subject areas! My students loved using the IMBs last year...but I need to use them on a more regular basis. I kept slipping back into my "old" ways of notetaking...eek! It definitely took me time, and I still had moments where I felt my notebook had more notes than interaction, but I think the best thing was that I kept with it. This is my first year doing an interactive notebook. I must do something to keep my kids' notes in one place. A binder just isn't cutting it anymore. I teach 6th grade resource math class to special needs students. Do you think that a INB will be a good fit for them? Is it better to use a spiral notebook (which is cheaper for me) or better to use composition notebooks? Thanks! I like the composition notebooks because I think they hold up better. I asked my students to bring them as part of the supply list, but watch the upcoming sales at Staples, Office Depot and Office Max. Last year I got them for 25 cents each. I ended up wanting another one for Word Work in Language Arts, so I just made the purchase. I think the using the Interactive Notebook would be really good for them. I taught an inclusion class this year with students who were really low, and having the notebook was so helpful to the ENTIRE family. It gave them a basis to help with studying when it came to be test time.